Steps from fun, restaurants and beach, in a quiet street ! In the heart of the historical Villefranche sur mer, this newly refurbished apartment has a gorgeous view on the bay and Saint Jean Cap Ferrat from the living room with 2 large bow windows, so plenty of sun ! 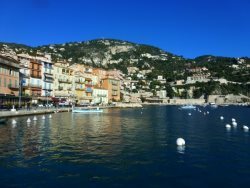 Located on a very quiet street, but steps from the sea shore, 5 mn's walk from restaurants and 10 mn's walk from the beach, it's an ideal starting point to discover Villefranche sur mer and the Riviera any season ! On the top floor of an old 18's century building, you will climb a couple of steps from the main entrance to reach the front door (2nd floor US and 1st floor Europe). From the main door, there are 5 steps up to the living room. The living area with the view, has a comfy couch sitting 6 people easily, a large dining table facing the bay, and an open plan kitchen fully equiped with fridge, freezer, oven, electrical stove, micro wave, dishwasher and more ! All the utensils are provided of course, and you will be able to cook a great meal while enjoying the views ! The living room has high ceiling with beams, and a roof window also. So plenty of light ! In the back of the apartment, overlooking another one of our properties with a garden, you will find a master bedroom with double bed, ensuite shower room, and large closets, and a second bedroom with a double bed also. There is a second shower room, and according to the French tradition, the loo is separate. In the second bathroom, you will also find a washer and a dryer. The apartment has full air con/heat according to the season, a high speed WIFI connection, cable TV in the living room. All the linens, towels, beach towels are provided, together with kitchen essentials and starting cleaning kit. The apartment can host up to 5 people, as there is an additional small bedroom with a XL twin bed, but that bedroom is only for a child or a teenager, as it only has an window opening to the living area. Children will love it ! From the apartment, it will only take about 10 mn's walk to reach the train station to explore the area, Nice is only 7 mn's ride away and so is Monaco. The airport is only 25 mn's away. If you are looking for a nice, new, clean, great views apartment, this is it ! And also, a real home, so very convenient for winter stays or French Institute students who'd like to relax and enjoy the old town after a full day of work in French ! We are very flexible rental periods, 4 nights minimum in low season and 5 in high season. Arrival day is flexible too. Check is at 5 pm. However, if you arrive earlier, we will always try to find a way to let you drop your luggage while cleaning team is at work. You will be advised as to when the apartment is ready. Also, as we asked our guests to advise approx arrival time, we usually try to organize the cleanings to give you access as soon as possible according to arrival time. Check out is at 10 am maximum, you can leave earlier of course. If you have a late flight, when possible, we will always try to help out. 30 % down payment is required to secure the booking. It can be done online via our website, or we will send you a form to fill. We only accept Visa or Master card payments, or bank transfers (bank transfers fees will be charged to the renter). Cancellation policy : 30 % down payment is kept unless we can rent the same period then only 150 € will be kept. Dates can also be delayed for another period. Contact us for CSA travel insurance if you live in North America or Europ Assitance for Europeans. Security deposit is held on credit card authorization and only debited if damages. A broken glas or plate is not a damage :) it's normal life. We only want you to let us know so we can replace. Stained linens, towels, etc... will be charged. Small well trained and behaving dogs can be considered, please ask. The only extra fee is final cleaning, which is 135 € up to 4 people and 150 € for 5 people. For some foreigners, it might sound expensive, but you don't clean a rental the way you clean your home : fridge has to be fully cleaned, kitchen, drawers, every corner inspected, oven when needed, etc.... It takes 3 full hours to clean this apartment. Then the final cleaning includes also all the linens, towels, beach towels,kitchen towels. Everything is cleaned with bacteria killers, at high temperature and ironed. For example, a beach towels's cleaning cost is 6 euros per piece, duvet covers are 13 euros, etc... So, final cleaning as it also included starting products, is not as high as it may seems to get the apartment up to our cleaning standards, which are the ones we would require for our own family. No smoking in the apartment (it's easy to go down the steps to the street if you need to.